Members of 5 Elements practice songs from their new album, “Enter the Zao,” in vocalist and “turn-tableist” Jim Logan’s basement. They practice late into the night after getting off work. Photo by Marissa McIntyre/The Jambar. 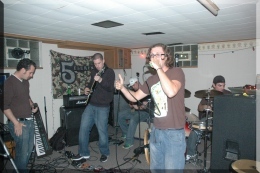 Six years ago, Jim Logan walked through the campus of Youngstown State University not as a student, but to promote his band, 5 Elements. Now, a month into the release of their first full-length album, Logan and the band prepare for the long haul. Logan, the band’s vocalist and “turn-tableist,” grew up with fellow members Josh Warnock, Tony Parent, Nick Barbush and Kevin Gallite. All graduates of Chaney High School, they started by playing music together as a hobby. “We’re all family. We used to just play all the time, messing around. It was never really a serious thing, and we started taking it seriously,” said Warnock, vocalist and guitarist. The band performs primarily in Youngstown but has performed in Cleveland, Pittsburgh and Columbus. They practice together three days a week, usually at night after they all get off work. “Party music is a real good way to describe it. It’s a cool, funky, reggae party music [for] people who like something like The Beastie Boys or Sublime mixed with classic reggae like Bob Marley,” Logan said. The band said their new album, “Enter the Zao,” is a step up from what they have done in the past. “I love it. It’s something we’re really proud of,” Warnock said. Two years ago, the band added a sixth element in lead guitarist Dan Newsome. Logan said he adds to the music and contributed to composing the new album. Whereas the other five elements have recorded in a studio before, it was a new experience for Newsome. “It was a lot of fun. It was different. I actually recorded a lot of my stuff on a PC; it sounded terrible. Nothing like it is now,” Newsome said. He was a fan of the band before joining. He started playing guitar after his mother died of cancer when he was 15. Now 23, Newsome said music is still his daily escape to deal with the stress of work. All members have jobs outside of the band, but take the band seriously and take time late at night to practice. “The band doesn’t pay the bills. The band pays the band’s bills, but for now, we all have to work other jobs,” Logan said. Still, he said they wake up in the morning, go to work and then rehearse late into the night — no matter what. “Music is my escape. I work 40 plus hours a week, so to be able to get off work and sing takes the stress away,” said Barbush, vocalist and keyboardist. Warnock said it’s a hard balancing act, especially with his daughter, but it’s worth it. Being a band for six years, they have formed a brotherhood. “Awkwardly enough, Jim and I work both our other jobs together and have the band together,” Parent said. Logan and Parent also work at Aladdin’s Eatery and at Valley Awning Tent. Parent said he hears growth from the kids who would play together as a hobby to where they are now. “We used to sound like crap, and now we can actually pull off a good set,” Parent said. Warnock said staying true to their Youngstown roots is important as the band continues to gain momentum. “It’s where we’re from. You can’t help but sing about or write about where you’re from. It’s a big part of us, and it’ll always be a big part of the music,” Warnock said. The band hopes to purchase a van for traveling and play more shows both in and outside of Youngstown.